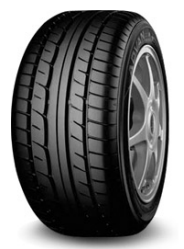 The Yokohama ADVAN A11A tire features not only an attractive and performance tread design, but a V speed rating as well. Whether it is on wet or dry pavement, the A11A delivers stability and confidence under performance conditions. Yokohama has made this tire for all types of cars and even light trucks. Don’t mistake this model as being strictly a performance driving tire. Along with a comfortable ride, the A11A is not as noisy as you might expect from a tire like this. The only thing to keep in mind with a tire like this one is that it is not designed for use in wintry conditions. The Yokohama A11A tire costs around $140 for a 16″ series. Who AreThe Yokohama ADVAN A11A Tires For? Yokohama has designed this model as an O.E. tire for many of today’s performance cars and sedans, or for those looking for a high performance summer driving tire that delivers predictable ride and handling characteristics. Yokohama does not provide a treadlife warranty for the ADVAN A11A tire. They do include a first 2/32″ wear guarantee on uniformity, as well as a 5-year guarantee on materials and workmanship. You get free first year or first 2/32″ wear replacement, followed by a prorated warranty for the remaining period.